Take advantage of this great opportunity to enjoy a traditional Romanian buffet in a beautiful Autumn atmosphere. The event will be opened by a performance of ”Izvorul” Dance Troupe and will be followed by a great music selection provided by DJ Sorin!! 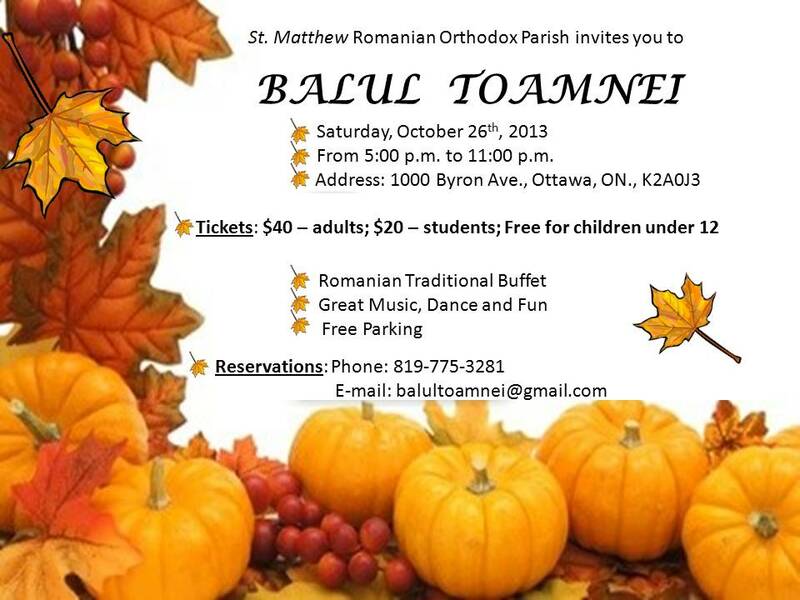 Balul Florilor will take place on October 26th, 2013 at the Ukrainian Banquet Hall on 1000 Byron Ave., Ottawa. Toate fondurile ce se vor aduna la acest eveniment vor fi utilizate exclusiv la constructia bisericii ortodoxe romanesti din Ottawa. Va multumim! We’re looking forward to seeing you at this unforgettable evening!